The accidental discovery of a 4th century burial in Poprad, Slovakia, in 2006 made national and international headlines for the exceptional richness of the find. Poprad, in the foothills of the High Tatra Mountains in northern Slovakia, is famed as a resort town and for its beautiful historic center, but this tomb was found by construction workers on a job site in an industrial area, not the historic center. Finding a tomb with a yew wood bed lined in sheets of silver was an unexpectedly thrilling surprise. The individual buried was found to be a young adult male about 30 years old at the time of his death. He was born in the area where his body was interred, but he spent significant stretch of time in the Mediterranean. The tomb dates to around 375 A.D., just a few years before from Rome’s withdrawal west of the Danube and the end of the formerly friendly relationship between empire and the German tribes who inhabited what would become modern-day Slovakia. Archaeologists think he may have served in the Roman army which was then hurtling towards disaster under pressure from barbarian migrations, both voluntary and Hun-driven, and dependent on the outer provinces and beyond for soldiers and mercenaries. He wouldn’t have been an infantry grunt. He was too wealthy and clearly a member of the elite of his own society. He was a person of rank, a prince or nobleman, the kind of person the Romans paid through the nose to fight for them as foederati, leaders of irregular units composed largely of their own men. The Visigoth king Alaric was one of those, until the emperor wouldn’t give him the command and lands he demanded so he sacked Rome to the bone not once, not twice, not thrice but four times. So was Childeric, King of the Franks. If he did fight for Rome, that would explain his movements, his valuables, and one very special artifact found in his tomb: his game board. In a tomb full of shiny treasures and rare preserved organic objects like a wood desk, the discovery of the rectangular board with a proliferation of small incised squares and a few playing tokens of green and white generated enormous excitement. The type was unknown to the archaeologists and even after years of assiduous research, it is still something of a mystery. “There has been not a playing board of similar type in Europe yet,” said Pieta for SITA. Games of this type were found in Greek and Roman temples on the floors or in the streets of ancient towns, carved into stone pavement. This portable wooden board game from Poprad is unique. The team enlisted the aid of those experts, Ulrich Schädler, director of the (absolutely charming) Swiss Museum of Games on Lake Geneva in Switzerland. Excited by the find, he was eager to get a closer view of the game and went to Slovakia to study it in person. His report is nothing short of glowing. “The board game from the tomb of the German prince in Poprad is a great discovery and contribution to the history of games in Europe. It’s the best preserved ancient wooden board game that has been found to the north of the Mediterranean Sea. Together with Roman glass playing pieces it was apparently a prestigious object that documented contacts of the dead with the Roman world,” said Schädler, as quoted by SITA. An analysis of the playing pieces revealed that it is ancient glass from the east Mediterranean, probably from Syria. “So the game was apparently brought from the territory of the Roman empire to under the Tatras,” added Pieta for SITA. 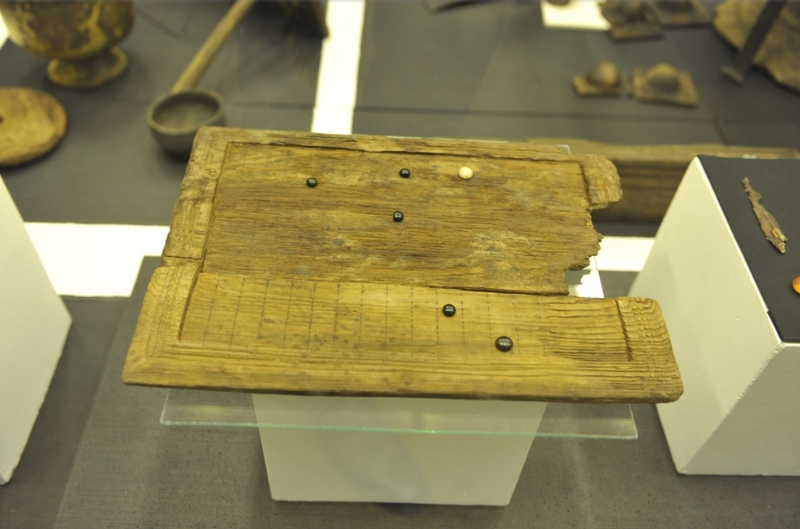 The game board will go on display at an exhibition dedicated to the contents of the tomb later this year at the Podtatranské Museum in Poprad.